We saw two Verdi operas in a row, one in the Staatsoper in Vienna and one in the brand new Opera House in Bratislava which has just been erected not to replace their historic opera house but to supplement it; the Slovaks are avid concertgoers and in a city with a population of less than half a million, two opera houses can be supported. It was a very useful thing to see these two productions back to back, especially for young Tanayut, the Thai violin student who has been with me on and off here. At the Staatsoper we saw a production with amazing orchestral playing, singers who were never less than extremely good, and a consistent and relevant interpretation. The Staatsoper's production of Simon Boccanegra was conservative in terms of costume and staging — the setting wasn't moved to a Nazi concentration camp and the blocking was quite basic and mostly of the "stand and sing" variety. But I don't mind that; it's how I grew up with opera and it can be distracting to have to sit through the masturbatory fantasies of a stage director who isn't attuned to the musical core of an opera. Myung Wun-Chung didn't exactly go all out in terms of Italianate phrasing but the orchestral playing was idiomatic and sensitive and always technically perfect. Bratislava's Aida was a pretty wild performance. There was a fair amount of spectacle, and an American soprano in blackface playing the lead (I think ...). The choreography was frequent and pseudo-Egyptian. There were a lot of people on stage. 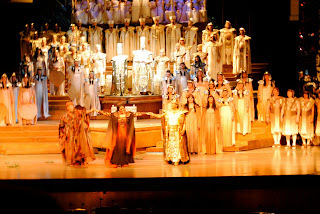 It wasn't the greatest Aida I've ever seen, but it had many good points. Of particular interest to me was the choreographer's bizarre notion of Egyptian dancing. I turned to Top at the end of the performance and asked him what he thought. This production is only the third opera he has ever seen, mind you, excluding two Opera Siam productions which he was actually on stage for, so perhaps they do not count. So I thought I would get a nice, fresh, naive impression of the production, but instead, Top said: "Well, the orchestra's wrong notes in the first few bars sort of set the thing off in the wrong direction. The tenor was dreadful, he was shouting instead of singing, the orchestra wasn't very good and when it comes to style, the Siam Philharmonic would have done a much better job." I quote this verbatim because there are two things that young Thai musicians need to learn when they encounter the richness and variety of classical music in Europe. One: they need to learn what a decent orchestra sounds like. Two, they need to realize that just because they are not Europeans doesn't mean that they themselves can't play better than the average orchestra in an average house in Europe. Top learned both lessons within two days. Both the enchantment and the disenchantment are important life lessons for a Thai musician. The tenor who sang Radamès in Bratislava's Aida wasn't that dreadful; he was just out of his depth, running out of energy by the end of the first act; he could only get through the entire opera by really pushing. But unless you have a Herculean tenor in your stable, the role will just kill your leading man off. Even world class tenors have been defeated by Radames. One could name quite a few, but one doesn't like to speak ill of the dead. 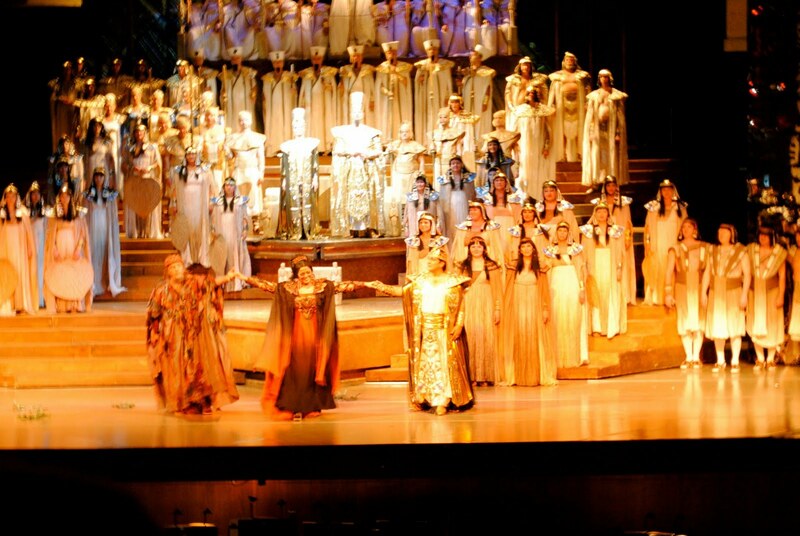 Also, the Amneris was striking, and beautfiful as well. It might have been a jolt to go from the world's finest opera house with the world's finest orchestra to your typical European opera house in a mid-sized metropolis. But the Slovak National Opera is great value for money. The most expensive seats are 30 euros and I noticed that the place was absolutely crammed with German speakers. Apparently they drive down from Vienna for the opera all the time and indeed for most of the history of Austria-Hungary, Bratislava was a suburb of Vienna (they're something like 30 miles apart, so it's like L.A. and Palmdale.) 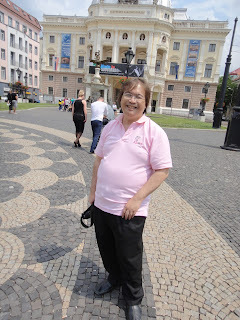 For most of the history we study in school, Bratislava was Preßburg, a German-speaking city with a huge Hungarian population and only a tiny Slovak one; it was even the capital of Hungary at one stage. It has really only become a Slovak city within living memory; after some populations drifted away and others were forcibly expelled after the WWII. Today is a day of calm where I'm able to catch up on some paperwork; tomorrow the Bratislava competition begins seriously.